​Funerals in either of our Churches (St Brelade and St Aubin on the Hill) or at the Crematorium are organised by and through the Funeral Director you have chosen to deal with your bereavement. You can, however contact us direct, by using the email button link at the bottom of the page or by telephoning the Rector on 01534 742302. We are also happy to conduct Memorial Services for those who have died away from the island or when ashes are returning to be placed in a family grave. If you would like to arrange this sort of service, then please contact the Rector. The Churchyard, is now closed for new burials, so all new graves are now made in the Parish Cemetery, the Cimetiere des Quennevais, which is situated between the Belle Vue Estate and La Rue Carree. Burials may take place in existing graves in the Churchyard if there is room in the grave without compromising the safety limits required by law. Cremated remains may be buried in the churchyard or the Rose Garden or in a family grave if there is room. Your Funeral Director will discuss your wishes with you and he/she will liase with the Verger. All burials in the churchyard are at the discretion of the Rector. Those in Les Quennevais Cemetery are at the discretion of the Connetable. For geneologists - and those looking for their ancestors! We have a computerised list of burials back to about 1810 (with a few gaps). Details of burials older than this are in registers which are now kept at the Jersey Archive. All registers, when full, are kept by the Archive so we now only have those which are current. 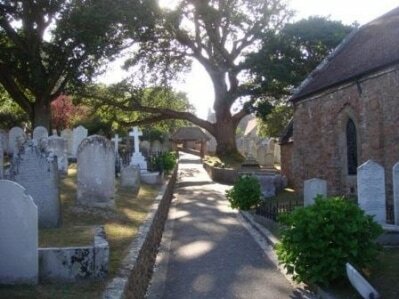 To contact Jersey Archive about old burials, or burials in a different parish, click on the link on the right.